Traders who use technical analysis are proud of applying scientific methods of observation and borrowing mathematical concepts from science… but then they fall prey to a superstition from the Middle Age that has never been proven. This is one of the great mysteries of the trading world. Italian mathematician Leonardo Pisano Bigollo, who lived between 1170 and 1250 in Italy and was nicknamed "Fibonacci" ("Son of Bonacci"), rediscovered a number sequence that had been known in India for centuries before him. The Fibonacci sequence is only one of many, many arithmetic sequences but does have some intriguing properties. For one thing, the Fibonacci sequence has a relationship to various phenomena in nature, like the spiral of the nautilus shell, sunflower petals, and so on. Other interesting properties include that it applies equally to negative numbers as to positive ones. Also, every third number is a multiple of 2, every fourth number is a multiple of 3, every fifth number is a multiple of 4, and so on. The Fibonacci sequence is 0, 1, 1, 2, 3, 5, 8, 13, 21, 34, 55, 89, 144, etc. Each number is the sum of the two preceding numbers. The magic of the Fibonacci sequence is that each number is approximately 1.618 times greater than the preceding number. This ratio forms the basis of the Golden Rectangle used by the ancient Greeks in their buildings and in painters throughout history to size canvases for the most pleasing shape to the human eye. If you divide any number by the one preceding it, you get 61.8. Sometimes the numbers after the decimal points are not exactly 61.8 − 8 / 13 = 0.6153 and 55 / 89 is 0.6179, for example. The higher you go in the sequence, the closer the number gets to 1.618 or 61.8. Another ratio that is consistent across the entire sequence is the 38.2% ratio, obtained by dividing any number by the number that is three places further on. In trading, Fibonacci numbers are often used to estimate the amount a move will retrace before resuming. We all know prices do not move in a straight line, but rather in a zigzag patterns of two steps forward, one step back. We use Fibonacci ratios to estimate the one step back as a function of the two steps forward. The process entrails finding a low and then the next high before a pullback. 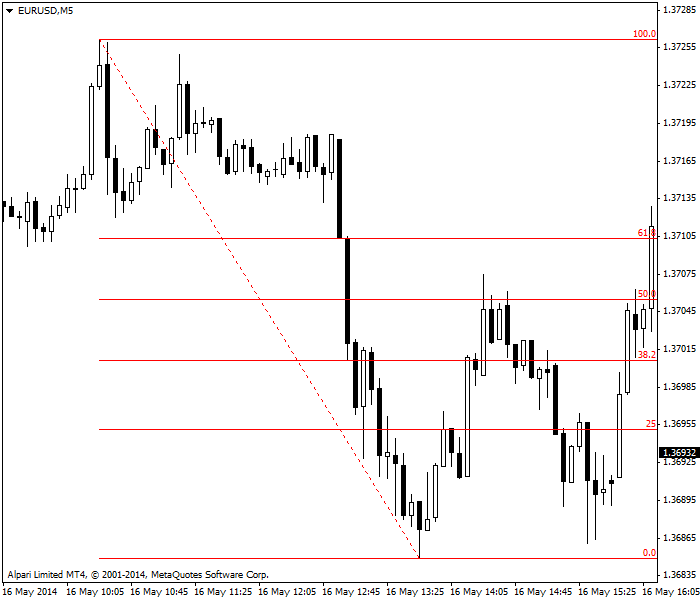 We assume the pullback or retracement will be in one of the key Fibonacci ratios – 23.6%, 38.2%, or 61.8%. When the price has pulled back as much as 61.8% of the previous upmove, we expect it to halt and that is where support will lie. If not, we expect a dip all the way to the lowest low where the upmove began, or a 100% retracement (even though 100 is not a Fibonacci number). Most analysts also include the 50% retracement, an idea that came from an early 20th century trader named W.D. Gann, although 50% is not a Fibonacci number, either. 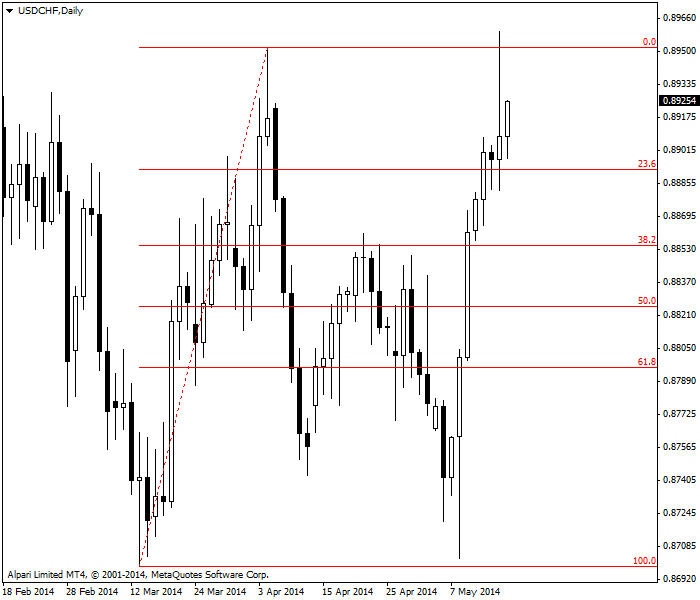 See the chart below, which depicts a picture-perfect 61.8% retracement of GBP/USD after a strong upmove. This chart certainly seems to validate the application of the Fibonacci sequence. 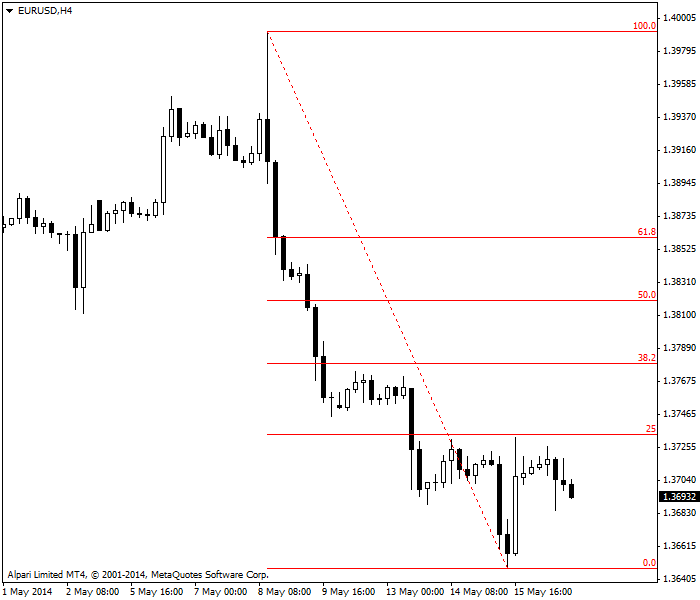 Now compare it to the next chart, where the 61.8% retracement was broken. The price then proceeded to bounce but then go almost all the way to 100% retracement — and then surpass the previous highest high. We may say placing support at the 61.8% retracement level was a failure but the “theory” worked in the end — the price did proceed to nearly 100% after the 61.8% retracement was broken. The next figure shows the EUR/USD on the H4 timeframe. 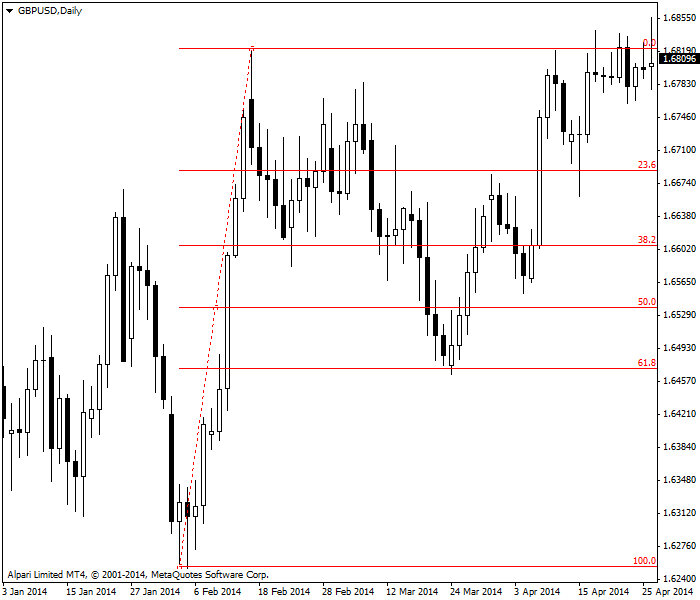 It is visually obvious that a pretty good place to put a stop in a euro short is just above the 25% retracement level. Another example below is showing EUR/USD on a 5-minute basis. The retracement surpasses 50% but does not make it to 61.8%, from which we deduce the rally is failing and we go short. Sure enough, the price goes almost all the way to the lowest low, our starting point, before resuming the upmove. As a general rule, Fibonacci retracements work somewhat better on shorter timeframes than on daily or weekly ones, which is probably due to so many traders accepting the Fibonacci retracement concept. A sufficient number of traders believe or suspect the Fibonacci sequence will work that they apply and therefore it does work — a self-fulfilling prophecy. Faith in the Fibonacci sequence is especially strong in Forex, despite no academically respectable studies having ever been done to validate the hypothesis that Forex prices follow the Fibonacci sequence. But because so many Forex trader embrace the concept, it does not pay to get sniffy about the lack of evidence. Many traders draw the Fibonacci lines as a matter of routine, just in case. the sum of the two preceding numbers. the preceding number multiplied by the one before it. Working the same for negative numbers as for positive ones. The ratio between numbers remaining the same into infinity. it is a natural law.